The 19th century was a time in which the United States rose to become the dominant power in the Americas. Under the guise of Manifest Destiny, the idea that the American people were destined to "conquer the west", the young nation expanded greatly. In the northwest border conflicts with British-held Canada were settled peacefully, with the border line being drawn at the 49th parallel. In the west and southwest the United States absorbed Texas after that country's successful bid for independence from Mexico, while the Mexican–American War and the Gadsden Purchase (not modeled in the game) led to an enormous cession of Mexican-claimed land to the United States. The issues of slavery and states' rights led to the vicious Civil War, resulting in the defeat of the secessionist states and the abolition of slavery. Now stretching from coast to coast, the US would grow still further with the purchase of Alaska. At home the Monroe Doctrine and later the Roosevelt Corollary ensured that the Americas saw only limited influence from other Great Powers and that the US was able to assert its dominance against minor countries in the region. Abroad America began to establish its own empire, obtaining concessions in China and Panama, forcing open trade with Japan, annexing Hawaii and most of the Spanish colonies, and rapidly laying claim to uninhabited Pacific islands. The United States borders Texas to the southwest, the United Kingdom to the north, and Mexico to the west. Russia controls Alaska to the far northwest. The UK may release Canada, Newfoundland and Columbia as dominions, while Deseret and the Californian Republic may split off from Mexico. 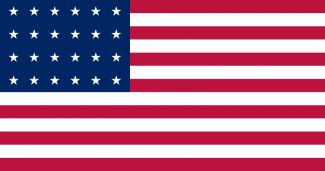 Many countries start the game with a positive view of the United States and are willing to form an alliance with it; the primary exception being the UK. Texas is especially eager for help from its large northern neighbor and once it is at peace it will seek statehood if relations are above 175. The player should improve relations with the UK from day one and work on getting them to max if no other pressing matters need attending. Ocassionally, the UK may decide that a land grab of some sweet colonial states from the large, but feeble USA is in order, but good relations can somehow diminish the chances of that happening. The first order of business military-wise should be disbanding the US Navy for the time being. It will not be useful anytime soon, and it costs maintenance money direly needed elsewhere. America should also secure alliance with the USCA and Colombia before unpausing. Both should readily accept and provide a very helpful second front in the upcoming wars against Mexico. Allying them will also prevent Mexico from doing so instead. The various slavery-related events almost unavoidably lead to A House Divided, which releases the Confederate States of America and starts the civil war. Players get the choice to continue as the USA or switch the CSA. Because the player has foreknowledge of the Civil War it can be stacked against either side. Only slave states will get CSA cores, and soldiers from CSA states will come under CSA control when the war happens. 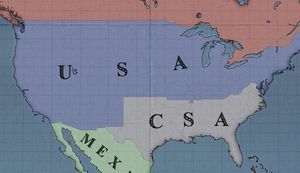 Depending on the side the player intends to choose they may limit the CSA to only the original slave states and have a large blockade in place at the start of the war, or they may grant it cores on all newly acquired states and rob the USA of its navy. Either side's army can be neutered by disbanding Yankee or Dixie troops sometime before the war breaks out. Winning the Civil War as the Union allows the Afro-American culture to be added as an acceptable culture. Rarely, the civil war may be prevented if the player manages to declare slavery illegal before the civil war has triggered.